Why should you avoid the auction house and use a sourcing agent instead to search for your property investment? 3) that it’s genuinely a decent, below market value deal. Not to mention the adrenaline at an auction house which may lead to poor decisions further down the line, particularly with first time property investors. The auction house absolutely has its place in the market, but if you analyse the benefits you get whilst purchasing investment property from a specialist agent like Sequre, the comparison is stark. How do Sequre source these homes before they go under the hammer? Banks, developers and receivers approach Sequre before taking their properties to auction. This is due to our ability to sell properties quickly to investors like you. Because we negotiate in bulk, we’re able to agree discounted prices, furniture packs and inclusive stamp duty in some cases. This is a much more efficient way of purchasing buy to let property. Investors benefit from instant equity and immediate income the day you complete on your property. The properties are always in great condition too – so no nasty renovation surprises to eat into your budget. If you’re looking to either buy your next investment property or you’re ready to grow your property portfolio, the team at Sequre are here to help. 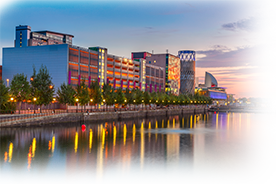 We have a number of deals in key city centre locations such as Manchester, Leeds and Liverpool which are tenanted, furnished and generate an income from day one. Give us a call today on 0800 011 2277 and we’ll find the perfect property for you.